Credit: X-ray: NASA/IOA/Fabian et al., Optical: NASA/U.Durham/Smail et al. 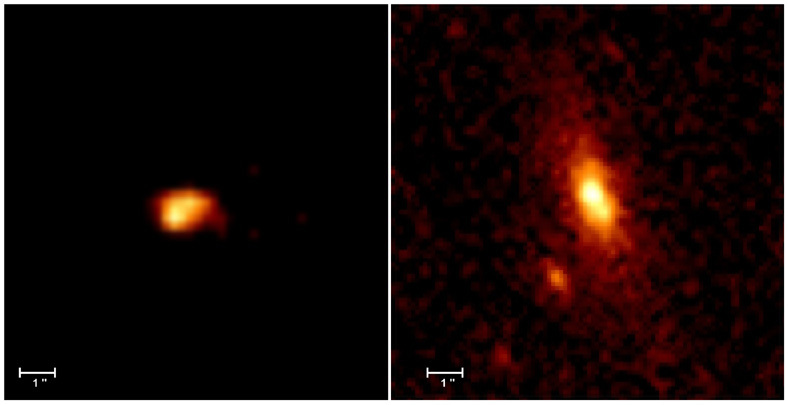 X-ray (left) and Optical (right) Images of Veiled Black Hole. The left hand panel shows the Chandra X-ray Observatory image of a powerful point-like source of X rays. The Hubble Space Telescope image (right panel) shows the spiral galaxy with which the X-ray source is associated. The X-ray source is located at the center of the galaxy, and has a deficit of low energy X rays, consistent with absorption by a thick cloud of gas. The combination of powerful X-ray emission, absorption of low energy X-rays, and the relatively normal optical appearance of the galaxy suggests that the source is a rare type of black hole called a Type 2 quasar. The spread-out appearance of the X-ray source is an instrumental artifact. The distribution of X rays is consistent with this source being point-like. The X-ray and optical image panels have the same scale, which is 10 arcsec on a side. Credit X-ray: NASA/IOA/Fabian et al., Optical: NASA/U.Durham/Smail et al. Scale Image is 10 arcsec across. Coordinates (J2000) RA 21h 53m 34s | Dec +17° 42' 40"